Not to be confused with Elementary algebra. and their representations through matrices and vector spaces. Systems of linear equations arose in Europe with the introduction in 1637 by René Descartes of coordinates in geometry. In fact, in this new geometry, now called Cartesian geometry, lines and planes are represented by linear equations, and computing their intersections amounts to solving systems of linear equations. The first systematic methods for solving linear systems used determinants, first considered by Leibniz in 1693. In 1750, Gabriel Cramer used them for giving explicit solutions of linear systems, now called Cramer's rule. Later, Gauss further described the method of elimination, which was initially listed as an advancement in geodesy. In 1844 Hermann Grassmann published his "Theory of Extension" which included foundational new topics of what is today called linear algebra. In 1848, James Joseph Sylvester introduced the term matrix, which is Latin for womb. Other hypercomplex number systems also used the idea of a linear space with a basis. Arthur Cayley introduced matrix multiplication and the inverse matrix in 1856, making possible the general linear group. The mechanism of group representation became available for describing complex and hypercomplex numbers. Crucially, Cayley used a single letter to denote a matrix, thus treating a matrix as an aggregate object. He also realized the connection between matrices and determinants, and wrote "There would be many things to say about this theory of matrices which should, it seems to me, precede the theory of determinants". Benjamin Peirce published his Linear Associative Algebra (1872), and his son Charles Sanders Peirce extended the work later. The telegraph required an explanatory system, and the 1873 publication of A Treatise on Electricity and Magnetism instituted a field theory of forces and required differential geometry for expression. Linear algebra is flat differential geometry and serves in tangent spaces to manifolds. Electromagnetic symmetries of spacetime are expressed by the Lorentz transformations, and much of the history of linear algebra is the history of Lorentz transformations. The first modern and more precise definition of a vector space was introduced by Peano in 1888; by 1900, a theory of linear transformations of finite-dimensional vector spaces had emerged. Linear algebra took its modern form in the first half of the twentieth century, when many ideas and methods of previous centuries were generalized as abstract algebra. The development of computers led to increased research in efficient algorithms for Gaussian elimination and matrix decompositions, and linear algebra became an essential tool for modelling and simulations. See also Determinant § History and Gaussian elimination § History. Until the 19th century, linear algebra was introduced through systems of linear equations and matrices. In modern mathematics, the presentation through vector spaces is generally preferred, since it is more synthetic, more general (not limited to the finite-dimensional case), and conceptually simpler, although more abstract. Identity element of addition There exists an element 0 in V, called the zero vector (or simply zero), such that v + 0 = v for all v in V.
Identity element of scalar multiplication 1v = v, where 1 denotes the multiplicative identity of F.
Elements of a vector space may have various nature; for example, they can be sequences, functions, polynomials or matrices. Linear algebra is concerned with properties common to all vector spaces. for any vectors u,v in V and scalar a in F.
When a bijective linear map exists between two vector spaces (that is, every vector from the second space is associated with exactly one in the first), the two spaces are isomorphic. Because an isomorphism preserves linear structure, two isomorphic vector spaces are "essentially the same" from the linear algebra point of view, in the sense that they cannot be distinguished by using vector space properties. An essential question in linear algebra is testing whether a linear map is an isomorphism or not, and, if it is not an isomorphism, finding its range (or image) and the set of elements that are mapped to the zero vector, called the kernel of the map. All these questions can be solved by using Gaussian elimination or some variant of this algorithm. For example, the image of a linear map, and the inverse image of 0 by a linear map (called kernel or null space) are linear subspaces. where v1, v2, ..., vk are in V, and a1, a2, ..., ak are in F form a linear subspace called the span of S. The span of S is also the intersection of all linear subspaces containing S. In other words, it is the (smallest for the inclusion relation) linear subspace containing S.
Any two bases of a vector space V have the same cardinality, which is called the dimension of V; this is the dimension theorem for vector spaces. Moreover, two vector spaces over the same field F are isomorphic if and only if they have the same dimension. If any basis of V (and therefore every basis) has a finite number of elements, V is a finite-dimensional vector space. If U is a subspace of V, then dim U ≤ dim V. In the case where V is finite-dimensional, the equality of the dimensions implies U = V.
Matrices allow explicit manipulation of finite-dimensional vector spaces and linear maps. Their theory is thus an essential part of linear algebra. is equipped of its standard structure of vector space, where vector addition and scalar multiplication are done component by component. with m rows and n columns. Matrix multiplication is defined in such a way that the product of two matrices is the matrix of the composition of the corresponding linear maps, and the product of a matrix and a column matrix is the column matrix representing the result of applying the represented linear map to the represented vector. It follows that the theory of finite-dimensional vector spaces and the theory of matrices are two different languages for expressing exactly the same concepts. Two matrices that encode the same linear transformation in different bases are called similar. Equivalently, two matrices are similar if one can transform one in the other by elementary row and column operations. For a matrix representing a linear map from W to V, the row operations correspond to change of bases in V and the column operations correspond to change of bases in W. Every matrix is similar to an identity matrix possibly bordered by zero rows and zero columns. In terms of vector space, this means that, for any linear map from W to V, there are bases such that a part of the basis of W is mapped bijectively on a part of the basis of V, and that the remaining basis elements of W, if any, are mapped to zero (this is a way of expressing the fundamental theorem of linear algebra). Gaussian elimination is the basic algorithm for finding these elementary operations, and proving this theorem. Systems of linear equations form a fundamental part of linear algebra. Historically, linear algebra and matrix theory has been developed for solving such systems. In the modern presentation of linear algebra through vector spaces and matrices, many problems may be interpreted in terms of linear systems. that is an element of the preimage of v by T.
Let (S') be the associated homogeneous system, where the right-hand sides of the equations are put to zero. The solutions of (S') are exactly the elements of the kernel of T or, equivalently, M.
It follows from this matrix interpretation of linear systems that the same methods can be applied for solving linear systems and for many operations on matrices and linear transformations, which include the computation of the ranks, kernels, matrix inverses. A linear endomorphism is a linear map that maps a vector space V to itself. If V has a basis of n elements, such an endomorphism is represented by a square matrix of size n.
With respect to general linear maps, linear endomorphisms and square matrices have some specific properties that make their study an important part of linear algebra, which is used in many parts of mathematics, including geometric transformations, coordinate changes, quadratic forms, and many other part of mathematics. The determinant of a square matrix is a polynomial function of the entries of the matrix, such that the matrix is invertible if and only if the determinant is not zero. This results from the fact that the determinant of a product of matrices is the product of the determinants, and thus that a matrix is invertible if and only if its determinant is invertible. Cramer's rule is a closed-form expression, in terms of determinants, of the solution of a system of n linear equations in n unknowns. Cramer's rule is useful for reasoning about the solution, but, except for n = 2 or 3, it is rarely used for computing a solution, since Gaussian elimination is a faster algorithm. The determinant of an endomorphism is the determinant of the matrix representing the endomorphism in terms of some ordered basis. This definition makes sense, since this determinant is independent of the choice of the basis. If f is a linear endomorphism of a vector space V over a field F, an eigenvector of f is a nonzero vector v of V such that f(v) = av for some scalar a in F. This scalar a is an eigenvalue of f.
If V is of dimension n, this is a monic polynomial of degree n, called the characteristic polynomial of the matrix (or of the endomorphism), and there are, at most, n eigenvalues. If a basis exists that consists only of eigenvectors, the matrix of f on this basis has a very simple structure: it is a diagonal matrix such that the entries on the main diagonal are eigenvalues, and the other entries are zero. In this case, the endomorphism and the matrix are said diagonalizable. More generally, an endomorphism and a matrix are also said diagonalizable, if they become diagonalizable after extending the field of scalars. In this extended sense, if the characteristic polynomial is square-free, then the matrix is diagonalizable. (it cannot be diagonalizable since its square is the zero matrix, and the square of a nonzero diagonal matrix is never zero). When an endomorphism is not diagonalizable, there are bases on which it has a simple form, although not as simple as the diagonal form. The Frobenius normal form does not need of extending the field of scalars and makes the characteristic polynomial immediately readable on the matrix. The Jordan normal form requires to extend the field of scalar for containing all eigenvalues, and differs from the diagonal form only by some entries that are just above the main diagonal and are equal to 1.
between the dual spaces, which is called the dual or the transpose of f.
of M, obtained by exchanging rows and columns. Note that in R, it is symmetric. with equality only for v = 0.
and so we can call this quantity the cosine of the angle between the two vectors. If T satisfies TT* = T*T, we call T normal. It turns out that normal matrices are precisely the matrices that have an orthonormal system of eigenvectors that span V.
There is a strong relationship between linear algebra and geometry, which started with the introduction by René Descartes, in 1637, of Cartesian coordinates. In this new (at that time) geometry, now called Cartesian geometry, points are represented by Cartesian coordinates, which are sequences of three real numbers (in the case of the usual three-dimensional space). The basic objects of geometry, which are lines and planes are represented by linear equations. Thus, computing intersections of lines and planes amounts solving systems of linear equations. This was one of the main motivations for developing linear algebra. Most geometric transformation, such as translations, rotations, reflections, rigid motions, isometries, and projections transform lines into lines. It follows that they can be defined, specified and studied in terms of linear maps. This is also the case of homographies and Möbius transformations, when considered as transformations of a projective space. Until the end of 19th century, geometric spaces were defined by axioms relating points, lines and planes (synthetic geometry). Around this date, it appeared that one may also define geometric spaces by constructions involving vector spaces (see, for example, Projective space and Affine space) It has been shown that the two approaches are essentially equivalent. In classical geometry, the involved vector spaces are vector spaces over the reals, but the constructions may be extended to vector spaces over any field, allowing considering geometry over arbitrary fields, including finite fields. Presently, most textbooks, introduce geometric spaces from linear algebra, and geometry is often presented, at elementary level, as a subfield of linear algebra. Linear algebra is used in almost all areas of mathematics, and therefore in almost all scientific domains that use mathematics. These applications may be divided into several wide categories. The modeling of our ambient space is based on geometry. Sciences concerned with this space use geometry widely. This is the case with mechanics and robotics, for describing rigid body dynamics; geodesy for describing Earth shape; perspectivity, computer vision, and computer graphics, for describing the relationship between a scene and its plane representation; and many other scientific domains. In all these applications, synthetic geometry is often used for general descriptions and a qualitative approach, but for the study of explicit situations, one must compute with coordinates. This requires the heavy use of linear algebra. Functional analysis studies function spaces. These are vector spaces with additional structure, such as Hilbert spaces. Linear algebra is thus a fundamental part of functional analysis and its applications, which include, in particular, quantum mechanics (wave functions). Most physical phenomena are modeled by partial differential equations. To solve them, one usually decomposes the space in which the solutions are searched into small, mutually interacting cells. For linear systems this interaction involves linear functions. For nonlinear systems, this interaction is often approximated by linear functions. In both cases, very large matrices are generally involved. Weather forecasting is a typical example, where the whole Earth atmosphere is divided in cells of, say, 100 km of width and 100 m of height. Nearly all scientific computations involve linear algebra. Consequently, linear algebra algorithms have been highly optimized. BLAS and LAPACK are the best known implementations. For improving efficiency, some of them configure the algorithms automatically, at run time, for adapting them to the specificities of the computer (cache size, number of available cores, ...). Some processors, typically graphics processing units (GPU), are designed with a matrix structure, for optimizing the operations of linear algebra. This section presents several related topics that do not appear generally in elementary textbooks on linear algebra, but are commonly considered, in advanced mathematics, as parts of linear algebra. The existence of multiplicative inverses in fields is not involved in the axioms defining a vector space. One may thus replace the field of scalars by a ring R, and this gives a structure called module over R, or R-module. The concepts of linear independence, span, basis, and linear maps (also called module homomorphisms) are defined for modules exactly as for vector spaces, with the essential difference that, if R is not a field, there are modules that do not have any basis. The modules that have a basis are the free modules, and those that are spanned by a finite set are the finitely generated modules. Module homomorphisms between finitely generated free modules may be represented by matrices. The theory of matrices over a ring is similar to that of matrices over a field, except that determinants exist only if the ring is commutative, and that a square matrix over a commutative ring is invertible only if its determinant has a multiplicative inverse in the ring. Vector spaces are completely characterized by their dimension (up to an isomorphism). In general, there is not such a complete classification for modules, even if one restricts oneself to finitely generated modules. However, every module is a cokernel of a homomorphism of free modules. Modules over the integers can be identified with abelian groups, since the multiplication by an integer may identified to a repeated addition. Most of the theory of abelian groups may be extended to modules over a principal ideal domain. In particular, over a principal ideal domain, every submodule of a free module is free, and the fundamental theorem of finitely generated abelian groups may be extended straightforwardly to finitely generated modules over a principal ring. There are many rings for which there are algorithms for solving linear equations and systems of linear equations. However, these algorithms have generally a computational complexity that is much higher than the similar algorithms over a field. For more details, see Linear equation over a ring. In multilinear algebra, one considers multivariable linear transformations, that is, mappings that are linear in each of a number of different variables. This line of inquiry naturally leads to the idea of the dual space, the vector space V∗ consisting of linear maps f: V → F where F is the field of scalars. Multilinear maps T: Vn → F can be described via tensor products of elements of V∗. If, in addition to vector addition and scalar multiplication, there is a bilinear vector product V × V → V, the vector space is called an algebra; for instance, associative algebras are algebras with an associate vector product (like the algebra of square matrices, or the algebra of polynomials). Functional analysis mixes the methods of linear algebra with those of mathematical analysis and studies various function spaces, such as Lp spaces. ^ Weisstein, Eric. "Linear Algebra". From MathWorld--A Wolfram Web Resource. Wolfram. Retrieved 16 April 2012. ^ Hart, Roger (2010). The Chinese Roots of Linear Algebra. JHU Press. ^ a b c d Vitulli, Marie. "A Brief History of Linear Algebra and Matrix Theory". Department of Mathematics. University of Oregon. Archived from the original on 2012-09-10. Retrieved 2014-07-08. ^ Benjamin Peirce (1872) Linear Associative Algebra, lithograph, new edition with corrections, notes, and an added 1875 paper by Peirce, plus notes by his son Charles Sanders Peirce, published in the American Journal of Mathematics v. 4, 1881, Johns Hopkins University, pp. 221–226, Google Eprint and as an extract, D. Van Nostrand, 1882, Google Eprint. ^ P. K. Jain, Khalil Ahmad (1995). "5.1 Definitions and basic properties of inner product spaces and Hilbert spaces". Functional analysis (2nd ed.). New Age International. p. 203. ISBN 81-224-0801-X. ^ Eduard Prugovec̆ki (1981). "Definition 2.1". Quantum mechanics in Hilbert space (2nd ed.). Academic Press. pp. 18 ff. ISBN 0-12-566060-X. ^ This may have the consequence that some physically interesting solutions are omitted. Fearnley-Sander, Desmond, "Hermann Grassmann and the Creation of Linear Algebra", American Mathematical Monthly 86 (1979), pp. 809–817. 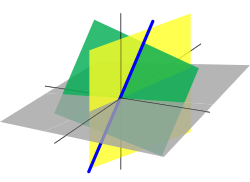 Wikimedia Commons has media related to Linear algebra.